Think of “Hangry Pockets” as your THM frozen dinners. Extreme hangry moments are not the time to be fixin’ and fiddling with food prep. Now thanks to Hangry Pockets, it won’t be your temper or waistline blowing up, only these delicious pockets as they steam in the oven.You can watch Serene and Pearl make this recipe by tuning into THM TV – “In the Kitchen”. Hangry Pockets, is Episode #9 of the “Hangry Meals” series. This is a single-serve recipe and can be found in Trim Healthy Table on page 320-323. Fold a 15-inch square of parchment paper in half and place it in front of you like a book, spine side facing left. Using scissors, cut a half heart shape around the open right side (like the wing of a butterfly), rounding the corner at the top and cutting down to a point to the spine at the bottom of your book shape. Open up your heart (or butterfly wings) and lightly coat it with coconut oil cooking spray. Place the fish or meat protein choice at the right side of the crease in the middle. Now add all the other ingredients into one huddle on the right side of the crease. Fold the left parchment page over the right, then working from the top open end, begin tightly folding the edges of the paper. Continue folding the edge, working downward to form a seal until you get to the bottom point, which you will tuck underneath the pouch. This is super quick and easy; just make sure it is tight so no air can escape. Use the examples to make a whole bunch of pouches and then put them in the freezer for future use, keeping a few in the refrigerator that you’ll want to use during the next few days. 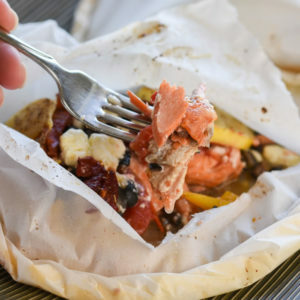 Bake the pocket in a preheated 400°F oven for 15 minutes for thin fish fillets or 20 minutes for thicker salmon fillets, chicken tenderloins, or ground or stew meats. (You can bake from frozen, but give it 40 to 45 minutes.) Remove from the oven, place the pouch on a dinner plate, and let it steam for another 5 minutes in the pocket before opening. Be sure to read the Recipe Notes below for a listing of options for the different proteins, veggies, seasonings and healthy fats that can be used when making “Hangry Pockets”! STEP 1: CHOOSE YOUR PROTEIN OPTIONS frozen or fresh white fish or salmon; frozen or fresh chicken tenderloins; frozen or fresh ground beef for S or at minimum 96% ground lean turkey; venison or grass-fed beef for E or FP; frozen or fresh diced stew meat for S.
NOTE:Choose quick-cooking veggies. If you’d like to include some veggies that are a bit tougher, you can do a quick steam to get a head start. FLAVORING OPTIONS: ¼ teaspoon Mineral Salt (go down from here if using other salty spices); soy sauce, tamari, Bragg liquid aminos or coconut aminos; dried parsley flakes or minced fresh parsley; minced fresh cilantro; minced garlic or a sprinkling of dried garlic; feta or other favorite cheeses for S (you can use a sprinkling of Parmesan for FP and E); diced chili peppers, cayenne pepper, or red pepper flakes; hot sauce; chipotle powder; Cajun seasoning; Nutritional Yeast; liquid smoke; cumin; lemon slices; apple cider vinegar; mustard; Italian seasoning or oregano. HANGRY POCKET “Fuel Pull” MEAL EXAMPLE: Easy, just build your E pocket but leave out the carb option. HANGRY POCKETS, they literally blow up with steam and lock in all the goodness of your food while quickly cooking a moist and succulent of your food while quickly cooking a moist and succulent gourmetfest of flavors in a pouch. In France they call this method of cooking en papillote, which actually means “in a butterfly.” Isn’t that fitting for a THM meal? NOTE: To fill up further, add a side salad or Speedy Chocolate Milk (page 457) or a baby-size shake or smoothie from the Shakes and Smoothies chapter (page 468). Watch Pearl and Serene’s video, “Hangry Meals #9 – Hangry Pockets“, on THM TV!